Strandline Resources Limited (ASX: STA) is an emerging heavy mineral sands (HMS) developer with a growing portfolio of 100%-owned development assets located in Western Australia and within the world’s major zircon and titanium producing corridor in South East Africa. Strandline’s strategy is to develop and operate quality, high margin, expandable mining assets with market differentiation and global relevance. Strandline’s project portfolio comprises development optionality, geographic diversity and scalability. This includes two zircon-rich, ‘development ready’ projects, the Fungoni Project in Tanzania and the large Coburn Project in Western Australia, as well as a series of titanium dominated exploration targets spread along 350km of highly prospective Tanzanian coastline, including the advanced Tanga South Project and highly prospective Bagamoyo and Sudi projects. The Company’s focus is to continue its aggressive exploration and development strategy and execute its multi-tiered and staged growth strategy to maximise shareholder value. The zircon and titanium markets have favourable growth-demand trends over the long term, driven by urbanisation of emerging countries and a broad array of applications, including products used in everyday life. Supply is being restricted by mine closures, declining grades and depleting stockpiles. New projects are required to meet market demand. 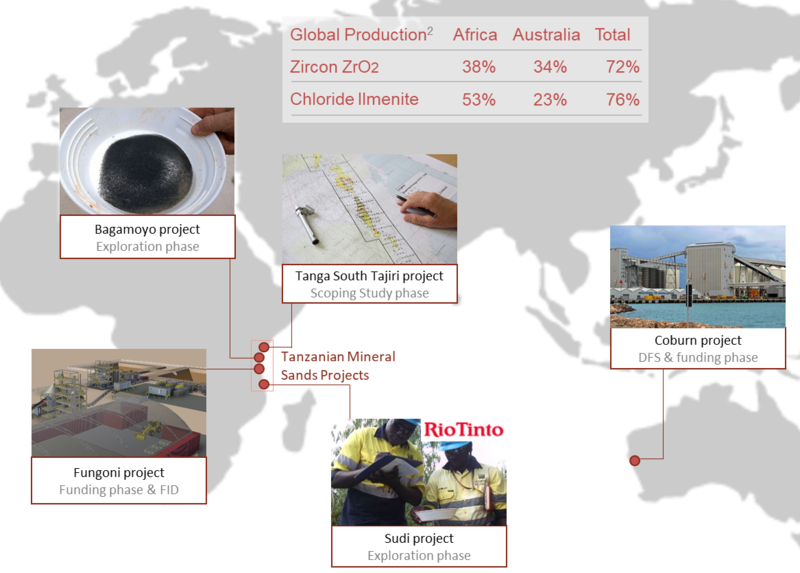 Development of the Company’s most advance projects, the Fungoni and Coburn mineral sands projects, is strategically timed to take advantage of the emerging zircon and titanium supply gap in the market. Strandline has recognized that the Tanzanian coastline represents a large gap in HMS resources between the countries of Mozambique and Kenya where several large to very large mines and resources have been previously discovered and developed. The Company holds a dominant tenement package along the Tanzanian coastline, approximately 350km of potential strike, which it is committed to systematically explore, and ultimately discover and develop a pipeline of quality projects. With a similar geological and geographic framework to Mozambique and Kenya, it stands to reason that Tanzania’s coastal zone should have similar economic HMS prospectivity. Primary and secondary sources of mineral sand (ilmenite, rutile, and zircon) in combination with large perennial river systems required to transport the mineral to the coast, and efficient high intensity coastal storm seasons suggest the discovery gap can be filled by systematic and methodical exploration. 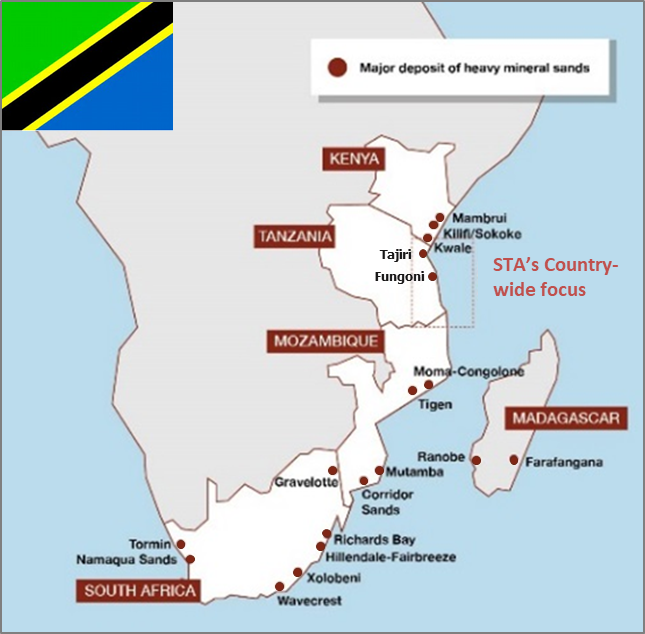 Strandline has been exploring the Tanzanian coastline targeting scalable, high grade, high unit value mineral assemblages (Ilmenite, Rutile, Zircon) close to well developed infrastructure that have potential to be rapidly brought into production. This has been achieved through interrogation of our substantial historic HMS geochemical database spanning the entire Tanzanian coastline. This first pass information has been key in allowing the Company to focus its exploration activities in areas of known higher prospectivity. The Company has completed a detailed airborne geophysical survey across most of the project areas that has provided valuable radiometric, magnetic and topographic data filters for exploration targeting. This information has been integrated with other geology and surface geochemistry data sets that has allowed the company to plan first pass discovery drilling programs that have been successful in defining new Mineral Resources and discovering extensions to known mineralisation. As the Company continues to systematically explore its highly prospective ground holdings in Tanzania the strategy will be evolving to increase the surface geochemical knowledge of the tenure with broad spaced surface geochemistry targeting prominent geophysical anomalies. Anomalies yielded from these soils programs can be rapidly, confidently and more efficiently elevated to drill-ready status. Strandline has assembled a motivated and highly skilled team of Tanzanian based geologists and field technicians and has demonstrated the ability to effectively engage with the community stakeholders and access ground for exploration whilst tapping into the local labour networks. Targeted air core drilling is planned to continue through 2018-19 with the view to extend current resource inventory and discovery of new high grade ore bodies for potential development consideration.